Where it is necessary to measure water in large quantities the meter illustrated will serve the purpose as well as an expensive one, and can be made cheaply. 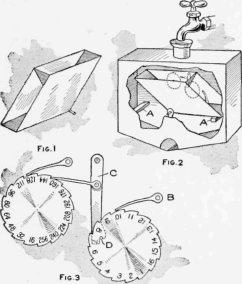 The vessel, or bucket, for measuring the water is made diamond-shaped, as shown in Fig. 1, with a partition in the center to make two pockets of a triangular shape, each holding 2 qt., or any amount of sufficient size to take care of the flow of water. The part forming the pockets is swung on an axis fastened to the lower part, which engages into bearings fastened to the sides of the casing, as shown in Fig. 2. Stops, A, are placed in the casing at the right places for each pocket to spill when exactly 2 qt. of water has run into it. It is obvious that when one pocket is filled, the weight will tip it over and bring the other one up under the flow of water." The registering device consists of one or more wheels worked with pawls and ratchets, the first wheel being turned a notch at a time by the pawl B, Fig. 3. If each pocket holds 2 qt., the wheel is marked as shown, as each pocket must discharge to cause the wheel to turn one notch. The second wheel is worked by the lever and pawl C, which is driven with a pin D located in the first wheel. Any number of wheels can be made to turn in a like manner. - Contributed by F. A. Porter, Oderville, Utah.